"I need a place to play my cassettes," the man said. He had liver spots on his shaking hand, the one that held the box. The box rattled with the gentle plastic. "Okay," I said and walked him to the small room that held two microfilm machines, a record player, a TV/VCR combo, and a small desk with a cassette player. He followed after me, and I slowed my steps so he could keep up. "Are you okay with the headphones that fit in your ears? Earbuds?" I said. He said maybe, not really understanding me. I went back to the reference desk and rummaged. I found an old pair of the over-the-ear type, the foam brittle and the plastic creaking. "...down to the shore and you kissed me," a woman's voice came from the corner of the dark room. I turned on the light and the man's hand shot forward and cut off off the voice by pushing the heavy button on the cassette player. "Please turn the light off. My wife…" the man said and turned to me. His eyes were wet and I cut the light and the eyes shone back at me. I handed him the headphones. He nodded. "Those tapes are of your wife?" I asked. He said, "Yeah. My Jessie. Her last few years, she would talk in them. My tape player at home broke, and they don't sell them anymore. Not around here." "Maybe I can find one for you. Let me ask around," I said. He said okay and thanked me. "The tapes. They keep me young." Sitting down with his back to me, his shaking hands found the input for the headphones and fitted them over his head. He bowed over the device in the dark and pushed the button again. I heard the woman's voice come loud from the headphones and his head drooped to his chest. I asked around, but no one had a cassette player to give to the man. No one that worked at the library. No patrons who might have one in the garage. One guy, a metal head wearing a "Lemmy is God" t shirt said that he had one for a car. It would not work, though. The man came day by day, sat in the room. Day by day he sat and listened to his cassettes of his wife. I do not know what she said, what kinds of stories or words she told. I know that he came in stooped and sad and left a little straighter, a little more hopeful. The man stopped coming. I never got his name, never learned what happened to him. He never told his story, just listened to his cassettes and thanked me and left better than he arrived at the library. A month after, a letter arrived. Inside was a single cassette and a note. The note read, "Thank you for helping me. Please remember my Jessie." No signature. I waited until the library was closed. I went to the media room, kept the light off, inserted the tape, and pushed "Play." A woman's voice followed a few creaks of the tape winding. She said, "Hey, you. Remember that night, not the first night we met, but the dance? I asked if you danced and you said yes, but not alone. You said you liked to dance with a partner. I was wearing that white dress with the bluebirds and you called me Thrush. It made my cheeks red and when the song came up, I asked you to dance. Well, I grabbed your arm and pulled you a little and you followed me out there. Remember how you held me, so unsure at first? You shook a bit. 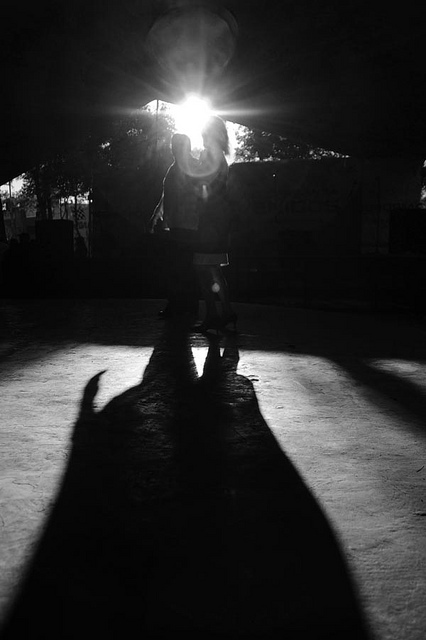 I told you to push back on my free hand and you pulled away, smiling, dancing the old way, apart. I told you to hold me closer. You held me closer. You looked me in the eye and held me close, and I knew you would always hold me the right way. We swayed to the song, that one about saving the last dance. After that first dance you left me, told me thank you and walked back to our table. But I waited for you. Well, I went to the bar for a drink," the woman said. She laughed and sighed on the tape, and I listened and waited for her. "The second dance, you came up to me. I had my hair cut short and you held out your hand and I remember the hair brushing my cheeks as I nodded. My smile was so big it pushed my cheeks to my hair. You looked so worried. I wanted you to be sure. That second dance I knew. You moved better then. Maybe you had a drink or two. I held you tighter. Otis Redding this time singing 'These Arms of Mine' so slow. Slower, better for us. You still looked me in the eye with that smile. I told you you were a great lead." The voice trailed off and tape went silent. I listened in the quiet room in the dark library. I let it go to static, noise from another quiet room in another time. She said, "I'm sorry I had to go first. I love you and the way you held me. I found that old dress the other day, the one with the blue birds on it. You never called me Thrush again after that, but it still makes me blush to think. Don't-"
The tape ended with a sudden click. I turned it over, but the other side was blank. Not even the static.